1. Line bottom and sides of an 8-inch square baking pan with parchment paper, then butter parchment. 2. Bring cream, butter, and fleur de sel to a boil in a small saucepan, then remove from heat and set aside. 3. Boil sugar, corn syrup, and water in a 3- to 4-quart heavy saucepan, stirring until sugar is dissolved. Boil, without stirring but gently swirling pan, until mixture is a light golden caramel. 4. Carefully stir in cream mixture (mixture will bubble up) and simmer, stirring frequently, until caramel registers 248�F on thermometer, 10 to 15 minutes. Pour into baking pan and cool 2 hours. 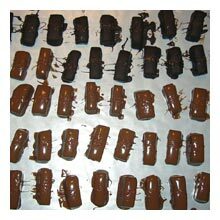 Cut into 1-inch pieces, then wrap each piece in a 4-inch square of wax paper, twisting 2 ends to close. These caramels are also great dipped in milk or dark chocolate and finished with a light sprinkle of fancy salt.